Cellular-level changes to a part of the brain's reward system induced by chronic exposure to the psychoactive component of marijuana may contribute to the drug's pleasurable and potentially addictive qualities, suggests a study in young mice published in Journal of Neuroscience. The results could advance our understanding of marijuana's effects on the developing brain as the drug's rapidly changing legal status increases its recreational and medical use in the United States. Drugs of abuse impact the ventral tegmental area (VTA) of the brain, which is rich in dopamine neurons. Using juvenile and adolescent mice, Jeffrey Edwards and colleagues investigated the effects of tetrahydrocannabinol (THC), the chemical in marijuana responsible for its effects on cognition and behavior, on VTA GABA cells, an understudied inhibitory cell type in the reward system that regulates dopamine levels. 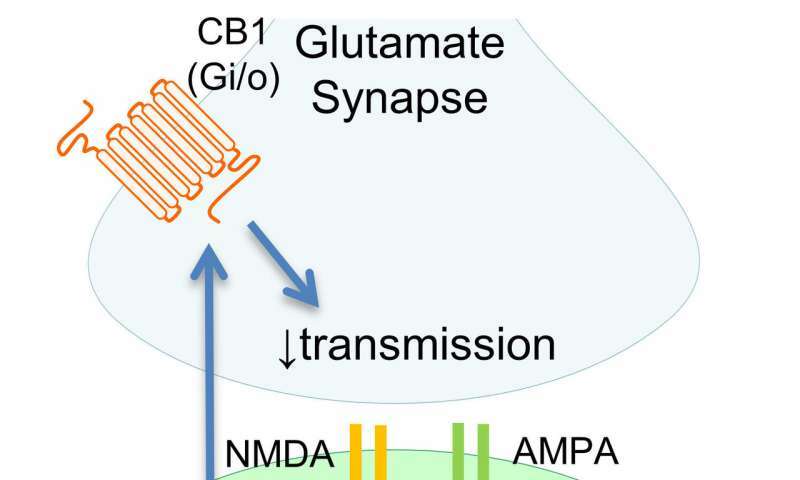 The authors found that a week of daily THC injections, but not a single injection, blocked the recovery of synapses onto VTA GABA cells in the mice. This finding suggests that persistent THC may alter the inhibitory function of these cells, increasing dopamine levels and the rewarding features of marijuana. These GABA neurons may represent a promising new target for treatment of cannabis use disorder, a common condition on the rise in the United States.